Homesteading was a central feature of the Euro American, African American, and immigrant settlement of the Great Plains. On May 20, 1862, President Abraham Lincoln signed the Homestead Act, formally “an Act to secure Homesteads to actual Settlers on the Public Domain.” Under it, the federal government offered settlers 160 acres of free public land. You had to pay a small processing fee, you had to live on your claim for five years and fulfill some other requirements, and then you “proved up” your claim to obtain your patent (title). Homesteading was open to male citizens over 21, war veterans of any age, widows and single women, married women who were heads of households, and new immigrants if they simply affirmed their intention to become citizens. When an 1866 civil rights act clarified that blacks were citizens, African Americans could and did homestead, too, as could citizens of Asian descent after an 1898 Supreme Court decision. The Act opened lands in 30 states, though principally homesteading occurred in the states north of Texas and west of the Missouri River. Between 1863 and 1961, approximately 1.6 million homesteaders successfully staked their claims and obtained title to their land. It has been called the federal government's biggest wealth-redistribution program ever. The goal of the Center's project is to make available data and other resources on homesteading to scholars and to provide an accurate and authentic narrative of the homesteading experience. Homestead National Monument of America, in partnership with the Center, the University of Nebraska, The National Archives and Records Administration, Ancestry.com, Family Search, and Fold3, is in the process of digitizing and making accessible the Homestead Case Files. These records are extraordinarily informative, but for years have been under-used by scholars and family historians alike because of access has been difficult. Now files are being digitized and made available, and several states are already complete including Nebraska, Arizona, Illinois, Indiana, Nevada, and Ohio. For access information, visit HNMA's website. 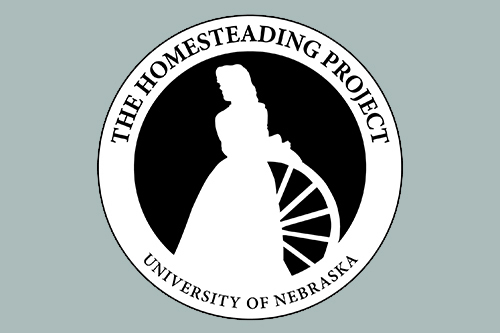 The Center for Great Plains Studies and the University of Nebraska Press released Homesteading the Plains: Toward a New History in September 2017. The book, by Richard Edwards, Jacob K. Friefeld, and Rebecca S. Wingo, reexamines the current consensus interpretation by historians of homesteading’s role in the settling of the American West. "[Homesteading the Plains] represents the first fruits of a massive digitization project. Two million individual land claims filed between 1862 and 1985 produced some 30 million pieces of paper. 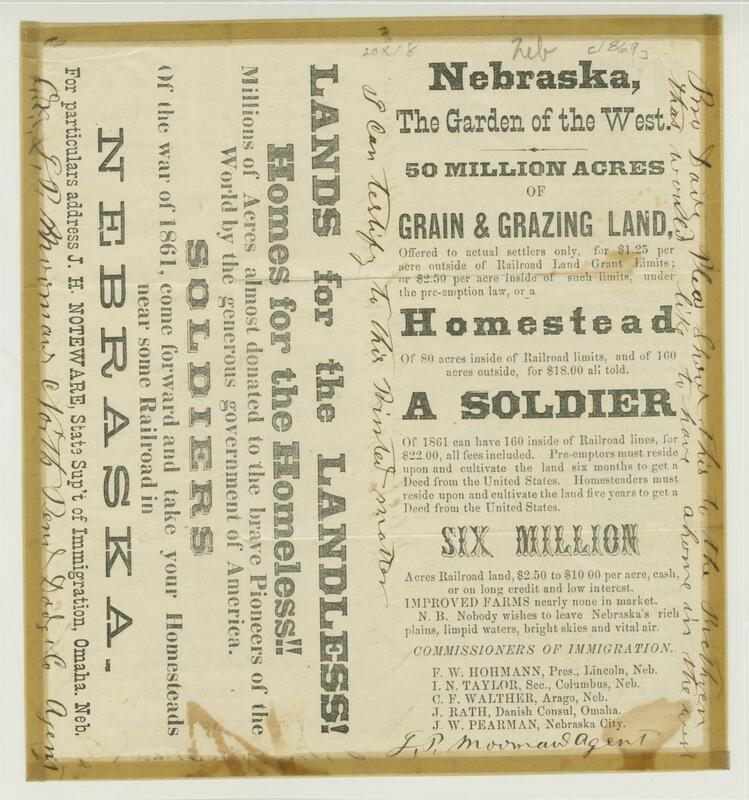 Nebraska claims are the first to be completely digitized. Stay tuned—there is much more to come. Every library with any interest in frontier/western/Great Plains history should have a copy of this book and, sometime in the future, access to the digital files." "Homesteading the Plains unsettles longstanding homesteading myth and history alike. Provocative and illuminating, it offers new data, technologies, and questions to open new historical terrain." 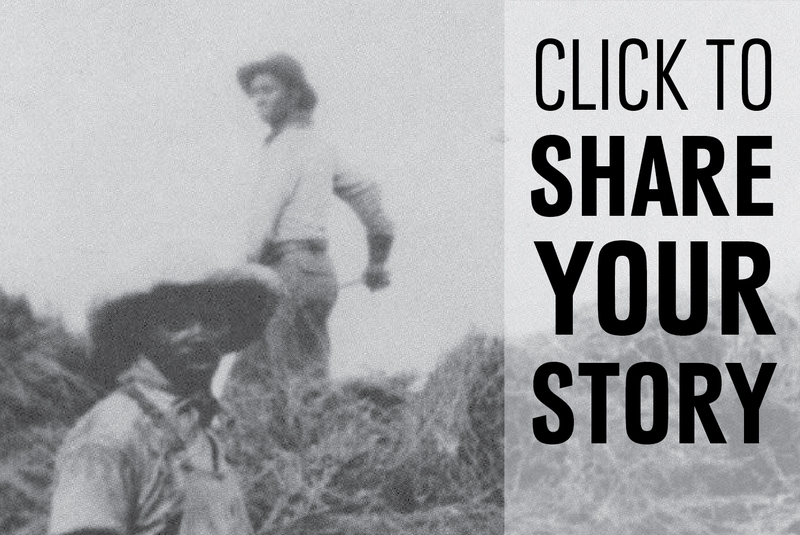 This project seeks to learn, preserve, and disseminate the story of African Americans who homesteaded in the Great Plains. The project is a collaborative effort with Nicodemus National Historic Site and the Homestead National Monument of America and is partially funded by the National Park Service. The project is producing a general survey of Black homesteaders in eight states: Montana, New Mexico, North Dakota, South Dakota, Wyoming, Nebraska, Kansas, and Colorado. The research will create the first extensive database of black homesteaders in these states. The project also focuses on six important Black homesteading communities or ‘colonies’: Blackdom, NM; Nicodemus, KS; DeWitty, NE; Empire, WY; Dearfield, CO; and Sully County, SD. They are the largest and longest-lived communities in each state. Read about the project in this Washington Post op/ed piece. “DeWitty and Black Homesteading in Nebraska,” Mikal Eckstrom and Richard Edwards, Great Plains Quarterly 38:3 (Fall, 2018). “New Evidence on the Number of Black Homesteaders in the Great Plains,” Richard Edwards, Jacob K. Friefeld, Mikal Eckstrom, and Richard Edwards, Great Plains Quarterly (forthcoming). “African Americans and the Southern Homestead Act,” Richard Edwards, Great Plains Quarterly (forthcoming). This work seeks to explore and explain homesteading in the Great Plains. “To Commute or Not Commute: The Homesteaders’s Dilemma” Great Plains Quarterly 38.2 (Spring, 2018), Richard Edwards. “The New Learning about Homesteading” Great Plains Quarterly 38:1 (Winter, 2018), Richard Edwards. 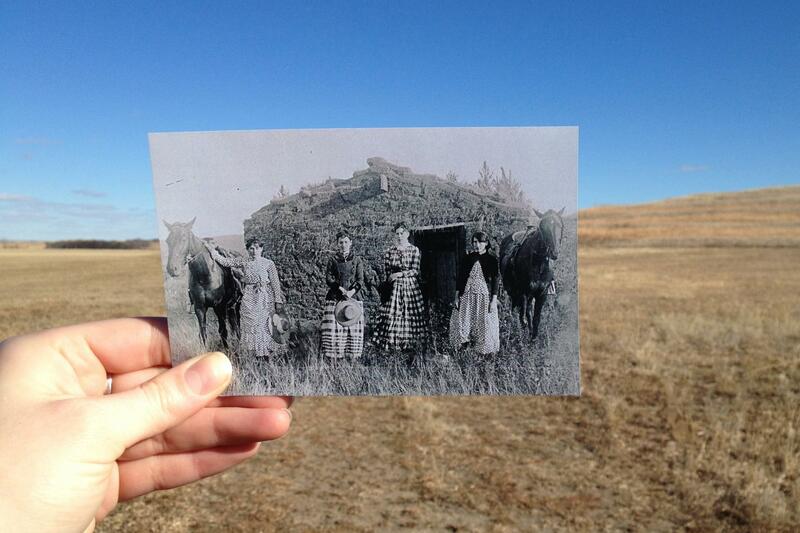 “Women’s Role in Homesteading the Great Plains” Great Plains Quarterly, Jacob K. Friefeld and Richard Edwards. Dr. Mikal Eckstrom talks about his newest article in "Great Plains Quarterly" on the homesteader site of DeWitty, Neb., titled "Staking Their Claim: DeWitty and Black Homesteaders in Nebraska." "Homesteading the Plains fundamentally alters the dominant frame for understanding the costs and consequences of settling the Great Plains. Not only have Edwards, Friefeld and Wingo amassed an astonishing amount of big data about homesteading—characteristics of land takers, who succeeded, who failed, and why—but they broaden our analytic perspective to include what the consequences of legislation and peopling meant for Native Americans whose land—through conquest and treaty—became public domain. Engagingly written, full of lively people’s stories, this book upends many tired and baseless myths about the settlement of the continent. The authors tell a nuanced, fascinating national story that is regionally rooted and beautifully illustrated with tables, charts and maps." 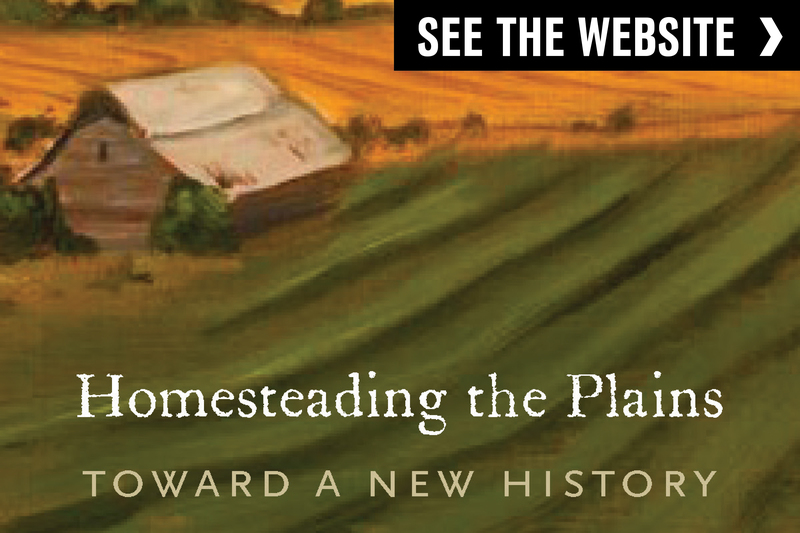 "Homesteading the Plains is a provocative plea for a new history of the Homestead laws. The authors argue that a yawning gap exists between public perceptions of the free land granting policies as great successes and negative scholarly assessments of those same laws as ineffective and even harmful failures tainted by fraud and corruption. The gap can and should be closed, they tell us in a compelling brief for historical revisionism, by critiquing dominant evaluations of the homestead laws and reexamining them with the kinds of questions, methods, and evidence that fill the pages of their book. Anyone interested in understanding the place of these almost mythic laws in the American past must read Homesteading the Plains." "Homesteading the Plains unsettles longstanding homesteading myths and histories alike. Provocative and illuminating, it brings new data, technologies, and questions to open new historical terrain." "This careful empirical analysis provides a long overdue corrective to frequently cited but flawed “facts” about homesteading in the nineteenth-century West. The authors persuasively demonstrate the impressive achievements of the Homestead Act and incisively evaluate the degree of fraud and Indian land dispossession on the homesteading frontier." "Attractively and accurately written, this book demolishes much conventional wisdom about homesteading — that it was a minor factor in settlement, that most claims never proved up, that fraud was "rife." The book also seriously revises the idea that homesteading dispossessed Indians, expands our understanding of women homesteaders, and explains how homesteading helped build communities. This is the most thoughtful analysis of homesteading to appear in many years." "Solidly researched, clearly written, logically organized, and cogently argued. The publication of Homesteading the Plains will not only be a contribution to knowledge but also field-altering in terms of the way scholars must hereafter write and teach about the Homestead Act." "The authors make a strong case for the need to revisit the history of homesteading, offering a comprehensive account of the historiography of the last five decades alongside their own interventions into the literature. Homesteading the Plains also integrates an important spatial dimension into our understanding of the relationship between homesteading and Native American dispossession, which has great potential for reshaping the history of land policy in the Americas." There are few instances of a wider gap between what the public believes and what scholars “know” than the story of homesteading. Ordinary citizens cherish homesteading as one of the triumphs of the American narrative, a generous and democratic opening of public lands to “actual settlers.” Today probably 46 million adult Americans and maybe as many as 93 million are estimated to be descended from homesteaders. Many families, often living in cities far removed from where their forebears staked their claims, retain a treasured story, a photograph, or a memory of their homesteading ancestors. But many scholars have a different view, seeing homesteading as a failure, infested with fraud, and in any event of minor importance in creating farms in the American West; unfortunately the consensus analysis is typically based on often-repeated anecdotes of unreliable generality, old and incorrect statistical assertions, undocumented stories, and lack of rigor. Today, scholars at the Center and elsewhere are writing a new history of homesteading, and thanks to digitized records and modern data analysis, this time they can base that history on the actual facts of homesteading. Their effort is still in its infancy and will require the contributions of many to succeed, but already it is producing some surprising results.